This year, I organized multiple service events to raise awareness for plastic pollution. One of my events was an Environmental Benefit Concert. I had performers from both in and out of our school community perform at the The Sidewalk Café to raise awareness for 5 Gyres Institute and Ocean Conservancy. We raised over $3,000 to split between these organizations. I found this experience to be one of the best in my life. I felt so powerful in using my passion to help the planet. I believe there is no better way to make change than to do it through love and positivity. I think music is a wonderful platform for that and I hope to do more of this work in the future. This year as part of my out of school service, I volunteered in the kitchen at God’s Love We Deliver. Even though it was my first time volunteering there, I was greeted with open arms into a jovial group of people. We first began by cleaning our hands and putting our hair up, and then cleaned the kitchen. Because many of the patients at God’s Love We Deliver have suppressed immune systems, we had to be extra careful to clean everything thoroughly, and did so a few times throughout the day. Then, we assembled around a few tables where a very charismatic chef dumped piles of carrots for us to chop onto the tables. We chopped these carrots for a few hours, being extra careful to keep the pieces small and the correct shape. This was a very rewarding experience for me because I felt the ways in which I would be helping people that day or the next. Being able to help those less fortunate than me made me realize how lucky I am to be able to work in a kitchen. My mom worked at God’s Love We Deliver in the ’90s, so she has told me about how happy the meals patients receive make them, so knowing I would make someone else happy was very rewarding. I also had a great time with the other volunteers as they were great people who laughed with us through the whole session. I was very humbled by my experience and see myself continuing to volunteer for God’s Love We Deliver in the future. For my group’s YPI project, we decided to research Homelessness as our social issue. Through this project, I furthered my understanding of how homeless men, women, and children are forced to live and what various opportunities exist to help bring them out of homelessness. My eyes were opened to a different life where gifts aren’t easily granted and people are very much left to fend for themselves because our society has been trained not to help them out of fear or ignorance. Our group chose the DOE Fund as the organization we were aiming to help during the course of this project. The DOE Fund offers help to all who need it and connects many to a better fitting organization for their needs. The DOE Fund targets men of color who receive the least amount of care from our society and are not easily offered jobs or a helping hand. This organization takes men who are willing and able to do work and puts them through a training program which readies them for college or jobs in the real world. Before I began my research for this project, I knew only what media had told me about the homeless population. I would pass by homeless people on the streets and think little of them because I was taught they are uneducated, bad decision makers, and “bums of society.” However, after having done this project I feel a new appreciation for those who have jobs such as cleaning the streets, and those who are desperately trying to find jobs or housing and better their lives through hard work. My attitude has especially changed relating to homeless veterans because our government treats many veterans unjustly even though they risked their lives to help our country. They aren’t given equal job opportunities, especially when dealing with disabilities given to them from war. The most challenging aspect of this presentation for me was choosing what was the most important information to share during our presentation, and creating a presentation that was informative but still engaged the audience. We acquired so much information about homelessness and issues relating to it, and deciding which facts or observations were most worthy of sharing during the presentation proved difficult. Also, it was difficult to create a presentation which both informed the audience of our issue but wasn’t simply throwing facts at people. Over the course of this project I feel I have gained public speaking skills, as I was very unsure of myself when public speaking previous to doing this project. I now feel more confident showing my work to many people, especially having worked so hard on my topic and knowing so much about it. I found knowing how hard I worked and presenting a presentation I was proud of most rewarding during this project. 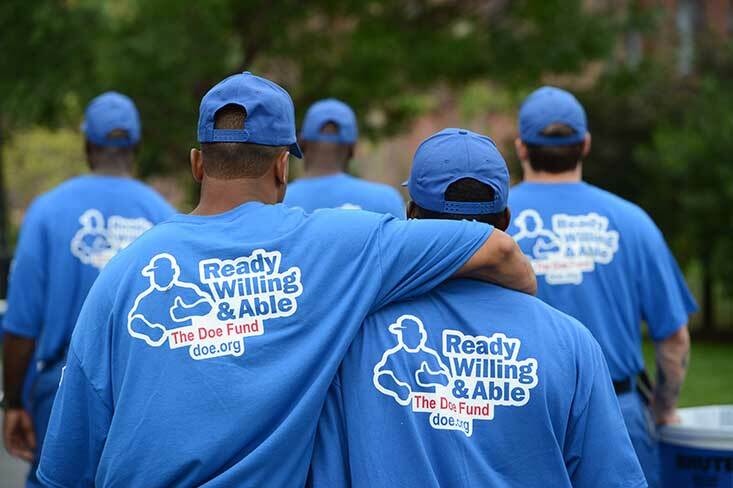 Also, seeing how these men were changed going through the DOE Fund‘s Ready Willing and Able program was quite rewarding as I knew that even if we didn’t win, these men were still being helped and could better their lives. I may continue to reach out, along with my group members, to the DOE Fund’s organization as I have seen them help so many in need and will definitely pay more attention to how I can better help the homeless population. This image shows some of the men who benefit from the DOE Fund‘s “Ready Willing & Able” program which gives men work around the city, which both benefits the city and the men who build a bond with each other and physically see the changes they can make upon such a big city by simply cleaning streets.